Steve Bannon in THE BRINK, a Magnolia Pictures film. The same could be said for Bannon himself, the former Trump official and campaign strategist who architected the Muslim ban and has since attempted to organize the far-right movement in Europe. 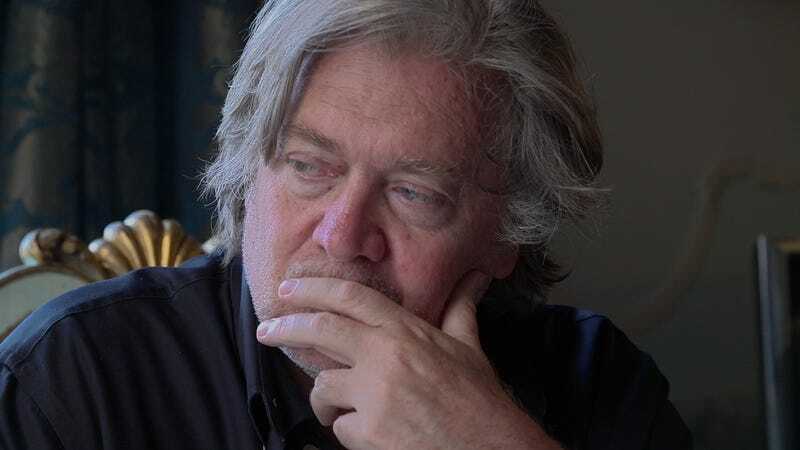 In The Brink, director Alison Klayman gained unprecedented access to Bannon and his allies for about a year leading up to the 2018 midterm elections, and it shows that Bannon is neither a cartoonishly evil nor a mad genius. Instead, he is deflated to what he really is: a guy who has continually been given a platform for his bad ideas in coffee-fueled conference meetings with rich people, simply by virtue of his pedigree as a white man who attended Harvard Business School, worked at Goldman Sachs, and ran the Trump campaign. Jezebel talked to Klayman about how to cover a figure like Bannon responsibly, what she learned after a year of observing him, and what she hopes viewers take away from the documentary. Our conversation has been a condensed and lightly edited. JEZEBEL: Did you have any concern that the documentary would somehow aid his agenda when setting off on this project? Alison Klayman: That was a concern. I thought about it every night going to sleep, honestly. But I made it because I felt like it was not a question of, “Is this movie going to give him oxygen and give his ideas oxygen?” because frankly he gets oxygen every day. He is still being covered. There are kinds of ways you can cover Bannon and the far-right and white nationalists that I think are irresponsible. But I unfortunately don’t think that ignoring them is really the thing that’s going to make them go away. Documentary film is different then journalism and it’s different than an ideas festival where you put someone else on stage. I think that the verité approach as well makes it something that is a lot harder to manipulate as a subject. I was in a position that literally no other reporter could be in. He had absolutely no creative control in the film. I filmed literally hundreds of hours, and I had the luxury of taking my time, of watching how he operates, and I brought to the film some questions that were, I think, relevant for people beyond just, “Look, isn’t it cool? I got to hang out with Steve Bannon.” So for me, inviting that conversation to take place about what is the media’s responsibility when it comes to covering people and recognizing how eyes-open he and these movements are about essentially trying to legitimize themselves through coverage—that was an important thing to do. If I thought this movie was going to just be a way for his ideas to reach more people, I wouldn’t make it, and I don’t think that’s what the film is. What did you learn about him, or the far-right movement, through this year-long process? I was constantly surprised by how self-aware he was able to be and had a good self-deprecating sense of humor. Yet a the same time, how often he seems to have a total lack of self awareness and would say things that were revealing. I think he has big blind spots, also, in terms of vanity. He as a character is very complex. The opening is a perfect example: When he talks about those good guys back in Germany at their desks with their cups of coffee being disconnected from the moral horror [of engineering the Holocaust], I think he was really excited in part in telling that story to be provocative. He knew that it was personally meaningful to me. My grandparents are Holocaust survivors. I went to Jewish Day School growing up. This is a huge part of my identity. I don’t think he realized that that was one of the most important reasons I was making the movie, and that him talking about the banality of evil was an incredible moment that showed a real lack of self awareness. The idea that they are disconnecting themselves from the moral horror of it. I mean that could describe him to a T with a lot of the policies and the ways he talks about people and the things he wants to do in the world. The name for the project when I first started it, for the first day—we didn’t have a title for the film, but I called the project Looking Glass, because I just felt like I had gone through to the other side, and part of spending that time with him was really like being embedded in this whole other world view. What I learned is that when you do get these people in a room together, they’re not talking about restructuring economies or regulating businesses. They’re talking about birth rates. They’re worried about the birth rate of a Muslim family versus a Belgian family. Anti-Islam and anti-immigration to the West from the global South is the main cause of concern and they are really unashamed of centering their messaging around it and putting on this little veneer saying it’s about economics. Because they all don’t think that they’re racists, and they think it’s laughable that they’re ever called racist. And it was like being through the looking glass. I did feel like part of why I think the project is valuable is, I came in and I did not for a second underestimate him. He enters an interview setting like it’s combat. I sat there and watched him a lot: he changes the subject, he throws other facts and figures at you, he distorts the meaning of facts and figures at you, he’ll just bring up something from some random part of history, which also can throw people off. And fundamentally, in the end, if you persist, he just gets to the flat-out lies and denial—like a grown man abdicating himself of all responsibility from the meaning of words he’s using. I think a lot of what you get in the human portrayal of verité is you’re just waiting for the character to reveal themselves, as opposed to coming and trying to brow-beat a point. And what would you even get from him? He’s just going to deny, lie, and fundamentally he doesn’t even see what’s wrong because he is detached from the humanity of the people that he is harming. When he speaks he does reveals who he is. But there are so many people who, when he speaks and reveals who he is, they like what he’s saying. And so what do with the fact that, when you show who he is, that resonates with so many people? This movie is not propaganda in the sense that I don’t think it’s going to turn his supporters away from him. The intended outcome is not about persuasion as it is exposing, revealing, and provoking questions, just because I think that’s what documentary does. I’m not accidentally, irresponsibly letting him say things that I don’t think he really means because it’s just part of his message without undercutting it. And here’s the thing about that “all media’s good media.” Just the fact that he agreed to do this film—he figured that it would be something that would be critical, but I think that there’s a certain kind of criticism that he is used to. And that is, being called a racist. Being called a dark, evil force. Being Darth Vader, death itself in SNL. These are all images that he actually loves because they’re powerful. And I think when it comes to being called racist, white supremacist, white nationalist, he’s able to say he doesn’t see himself that way. Very few people actually see themselves as racists. I don’t think that he imagined a critique that led viewers to think that he doesn’t have that many ideas, or that he’s actually just in the pocket of the super-rich, his organization is kind of a joke, he’s kind of an opportunist. When I was watching it, that was a constant question based on his claim that all media for him was good media, and as a viewer, I felt conflicted about the idea that he might be loving this. Did you grapple with that? I really think that I had to let go, and I think I have, of that particular part of it, too: “Oh, he’d love this part,” or “Oh, he’d hate this part.” Or “What will he think of the movie in general? It was hard, spending that much time with him. I haven’t seen him since the midterms, so every day in editing he became more distant. In the end, I just really had to let go of what he thought of the movie being important, because I think ultimately, the least important audience member for the film is Steve Bannon. And that’s why we wanted the movie to be about something bigger than him, too. About [the rise of white nationalism] in Europe. He’s trying to make it seem he is playing a bigger role, but that’s an important story to share with American audiences and to remind Europeans that it’s important to go out and vote. I think reminding people that Bannon is not a fringe figure in the Republican party. He is the mainstream Republican party and that is an important thing to remember, and give up the idea that there’s some good Republicans, or there’s an insurgency versus the mainstream. I think that’s not true anymore. To talk about the role of billionaires in this populist movement and of course to talk about the role of media. Definitely, if the only thing about this movie is that people are talking about him more, that would be a failure. It’s really important to talk about the bigger picture. How did being a woman director influence your approach or access to Bannon and his inner circle, which is all men? To stick with the whole, “Let him be underestimate me and never let me underestimate him,” I didn’t really lean into any particular persona when filming. He would call me his “lefty commie Brown University filmmaker.” In general, I would just try to wear all black and be this fairly neutral presence because I just wanted to be in the room and film for longer. I think that it’s easier to underestimate a younger woman who’s just there by herself. And I love that my producer always says that’s not why she chose me, but it is a benefit in that sense. I think that my perspective as a woman influenced everything about how I made the film, just like how my politics and my personal upbringing did, too. [Bannon’s] “rose between two thorns” [comments about women in photos flanked by men], definitely funny, but I wonder if another filmmaker, if you’re not a woman, does that immediately rub you the wrong way, the way it did me? I’d just often be noticing how the rooms were very male, as well as obviously very white, and when I saw how the midterm election played out and where my hope was, I really loved being able to spotlight that in the ending. Because to me, they are part of the same story. I think that the far-right is not going to beat itself, but I have a lot of faith in the new left and the justice Democrats and this new class of Congress, women especially. They are the opponents that can beat this side.